Eventually, I'd like to make a banana bread with no added sweetener other than stevia, as well as a banana bread that doesn't use eggs. 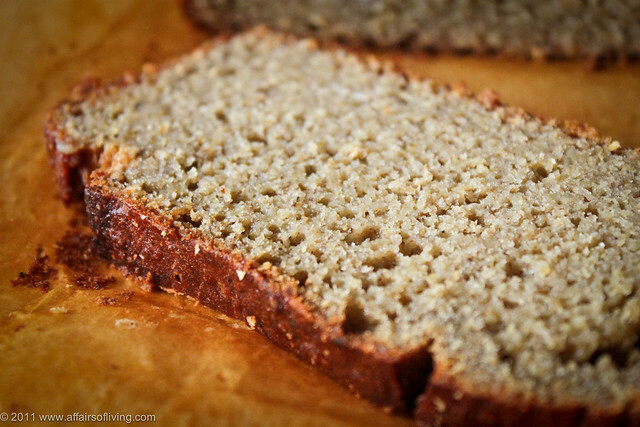 But for now, this is my new go-to banana bread. I think you'll love it. This post is linked to Slightly Indulgent Tuesday at Simply Sugar & Gluten-Free. 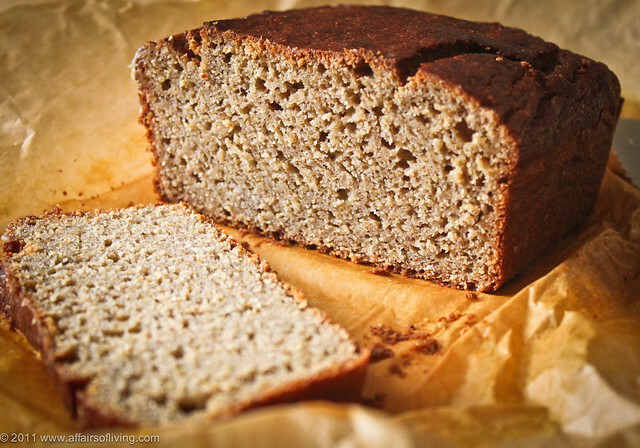 This recipe is largely sorghum flour-based, with a blend of tapioca starch for a crisp, brown crust, quinoa flakes for extra binding ability and fiber, and brown rice flour or millet flour for a nice crumb. I have tried this recipe using flax "eggs" instead of chicken eggs, and it was a failure - too heavy, gummy, and moist. Try substituting the eggs at your own risk. I'll try to come up with a good egg-free version soon! Heat oven to 350º F. Line an 8-inch x 4-inch bread pan (or similar size) with parchment or coat with coconut oil and dust with flour, and set aside. I prefer the parchment route, as a successful removal of the loaf from the pan is almost a guarantee. Peel bananas and break each banana into a few large chunks. Place in a food processor, pulse, then process until smooth. Then add eggs, oil, and sweetener and process until just combined. Then add remaining ingredients, pulse a few times, and process until fully combined. Pour batter into prepared bread pan and bake for 1 hour, until bread is golden brown and toothpick comes out clean. Remove from oven and let cool for about 5 minutes on a wire rack, then remove loaf from pan and allow to cool completely. If you don't have a food processor, don't fret. Simply mash the banana as smoothly as you can in a large bowl, or blend until smooth in a blender. Then beat together with the eggs, sweetener, and oil until smooth and creamy. In a separate bowl, combine the dry ingredients, then add to banana mixture and stir until combined. Bake as directed. Easy! Older PostThe MPLS Swappers are featured in Minnesota Monthly!